While the underlying technology and patterns are certainly interesting, microservices have always been about helping development teams be more productive. Whether used as a technique for architects to manage complexity or to make small teams more independent and responsible for supporting the software they create, the human aspect of microservices cannot be ignored. 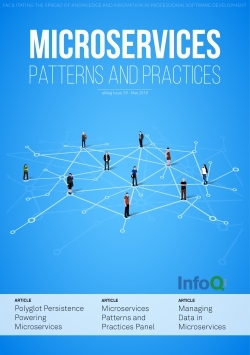 Many of the experts who spoke about microservices patterns and practices at QCon San Francisco 2017 did not simply talk about the technical details of microservices. They included a focus on the business side and more human-oriented aspects of developing distributed software systems. Polyglot Persistence Powering Microservices - At Netflix, the cloud database engineering team is responsible for providing several flavors of data persistence as a service to microservice development teams. Roopa Tangirala explained how her team has created self-service tools that help developers easily implement the appropriate data store for each project's needs. Patterns for Microservice Developer Workflows and Deployment: Q&A with Rafael Schloming - Drawing on his experience with developing a microservices application at Datawire in 2013, Rafael Schloming argued that one of the most important — although often ignored — questions a development lead should ask is "How do I break up my monolithic process?" as the development process is critical to establishing and maintaining velocity. Debugging Distributed Systems: Idit Levine Discusses the Squash Microservices Debugger - With microservices distributed across containers, how is a developer able to step into the code and debug what is happening? Idit Levine discussed the problem and introduced Squash, an open-source platform for debugging microservices applications. Microservices Patterns and Practices Panel - In this panel discussion several experts shared their experiences and advice for being successful with microservices. Questions from the audience highlighted common themes, such as dealing with deployments, communication between microservices, and looking at what future trends might follow microservices. Managing Data in Microservices - Randy Shoup provided practical examples of how to manage data in microservices, with an emphasis on migrating from a monolithic database. He also strongly advocated for building a monolith first, and only migrating to microservices after you actually require the scaling and other benefits they provide.